Hiyooo Monday! YOU GUYS! This is the last Monday of school for me. THE LAST MONDAY. Kind of. More on that later. First: let’s talk weekend! How was yours? What did you do? Where did you go/not go? Are you or are you not psyched for this week? I’m actually unnaturally psyched for this week, which is unusual, and I’m not exactly sure why. Maybe because of the weekendiest weekend ever? Or maybe because I find out where my internship interviews are today? (again: more later). This weekend, Marc and I packed up quickly to head out ASAP on Friday with our eyes set on the BEACH! Kind of. We rolled into Seaside and up to the Tillamook Head trailhead, then proceeded to hike UP UP UP and over the head into the backpackers campsite. Talk about a crazy trail — there were trees down everywhere and a few very bushwacky sections, but we took it in stride (ha! totally not on purpose, I swear) and made it to the campsite before dark. WIN! Of course we stopped and took pretty ocean pictures, ate tons of salmonberries, and admired the MASSIVE hemlocks along the way. Luckily, Friday was gorgeous weather. We knew it was going to turn rainy in the night, and forecast was definitely accurate (if not a bit on the optimistic side). We woke up around 1:30am to what sounded like MASSIVE raindrops hitting the tent — you know how they always sound ten million times bigger/louder when you’re in the tent? I’m pretty sure they actually were massive, regardless of tent amplification. But hey, we’re Oregonians! Rain can’t slow us down. We still had a lovely morning, made breakfast, hiked out to the end of the head, then packed up our soggy soggy tent and headed back to the car where we had, smartly, stashed dry/real clothes! First stop after that: sandwiches. Obviously. And coffee. HOT coffee. We earned it, FOR SURE. The rest of Saturday was spent meandering down the coast on 101, stopping to put my feet in the sand once the weather cleared up, and eventually making it to the new home of our dear friends in Florence. We walked, we laughed, we cuddled the dog, we went out for delicious food, we slept like logs on a very comfy air mattress, we made (well, Elizabeth made) UHMAZING waffles for breakfast — all in all, a short but very sweet visit. And then we drove home, where the test is currently dripping all over the entry and the rain fly in the shower. SUCCESS! We seem to be on an every-other-weekend schedule for getting out into the woods for a night … which is a pretty darn good schedule if you ask me! When is the last time I had an interview? Um. A LONG time ago, and definitely not for a technical job (helloooo whiteboarding and technical interview questions!). I know I’m competent at talking to people, so overall I’m not *too* intimidated by interviews… but sometimes I think I should be. Today I actually have my mock interview with a teacher at school, so that will hopefully be a good indication of how I can improve my interviewing skills. WISH ME LUCK. Or something. 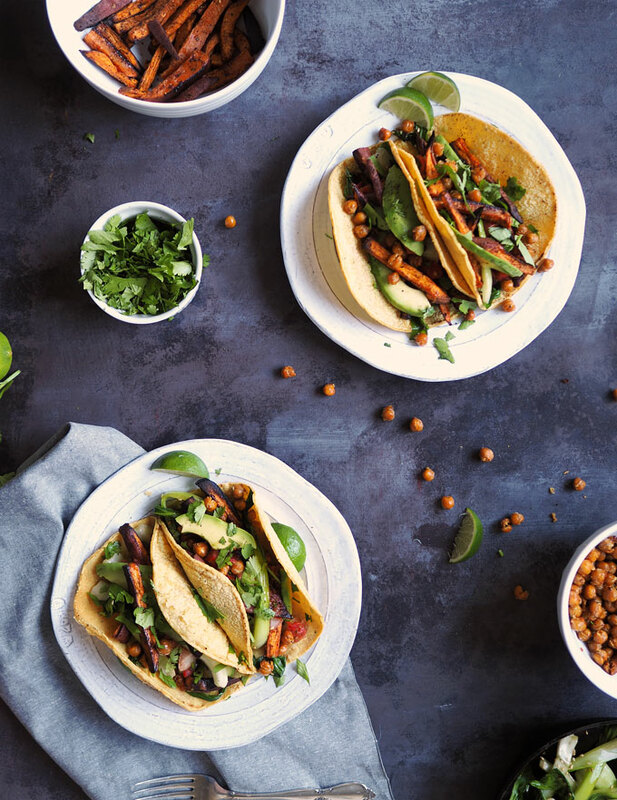 Who wants to talk tacos? I DO ALWAYS YES PLEASE YES. These tacos were no joke. They were SO TASTY. 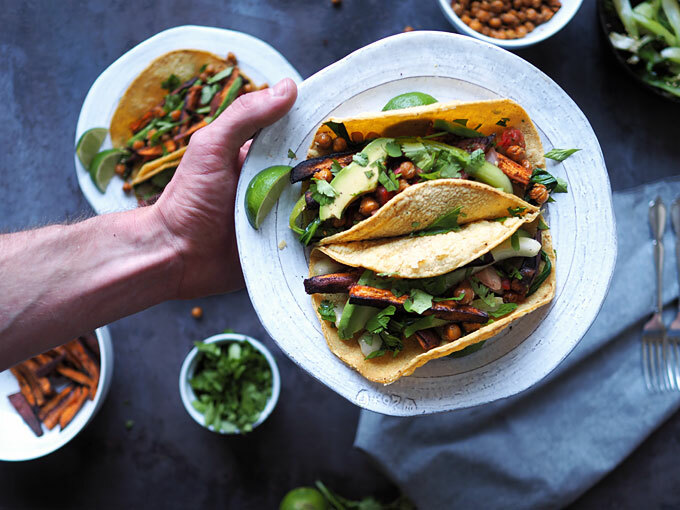 I wanted something with crispy chickpeas, because they’re amazing and salty and savory and YUM, but also wanted sweet potato tacos. 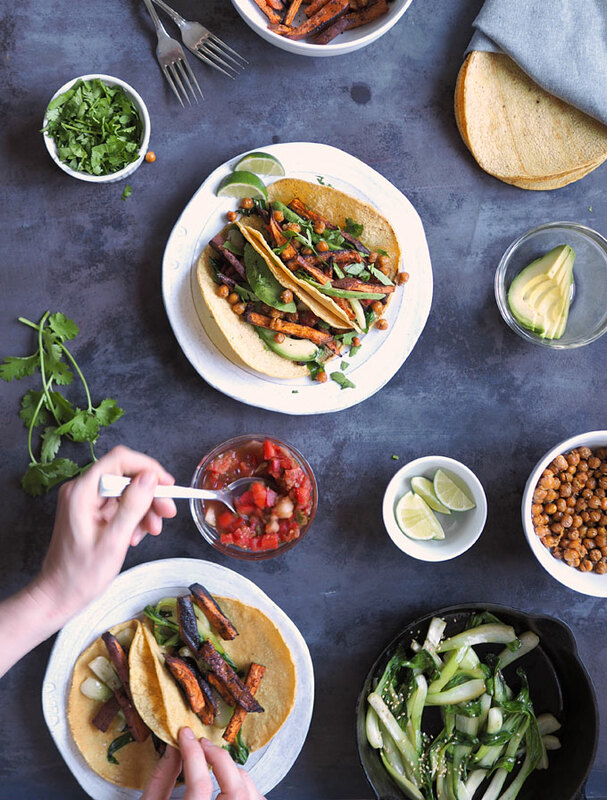 Enter these tacos, plus bok choy because GREEN VEG ftw. 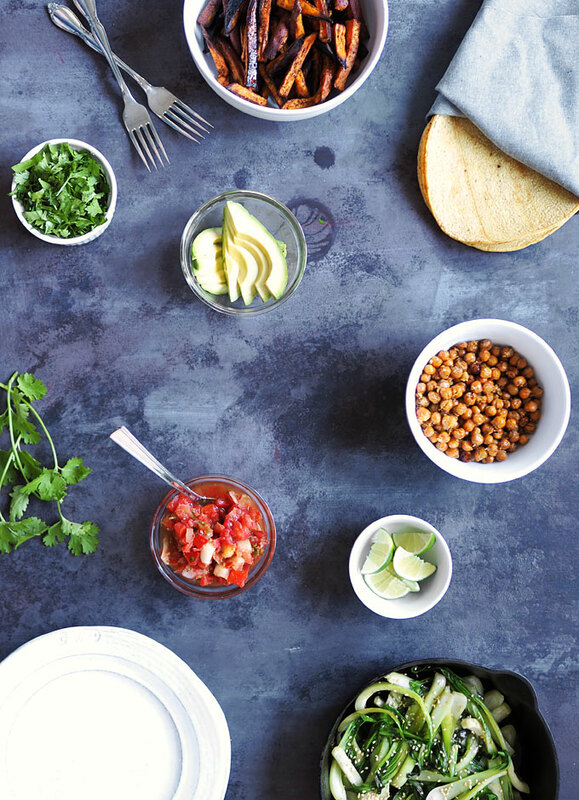 Add some extra tasties like avocado and cilantro and salsa (or whatever you want) and EAT EM UP. One note on the chickpeas: they’re crunchy and hot and crispy when you take them out of the oven, but over time they do get chewy as they cool! So, I like to leave them in the oven until I’m ready to serve, and put them on the tacos last! Start with the sweet potatoes, since they take the longest. Toss the cut sweet potatoes with the olive oil, salt, pepper, cumin, and ground chipotle powder. Arrange on baking sheets so that they are NOT touching each other, and bake for 30-40 minutes, or until cooked through and beginning to blacken around the edges. As soon as the sweet potatoes go into the oven, start on the chickpeas. Pat the chickpeas as dry as you can with a paper towel, then toss with the olive oil, salt, pepper, and chipotle powder. Spread into one layer on a baking sheet and add to the oven with the sweet potatoes. Cook for about 30 minutes total, or until crisp. Slice the baby bok choy into strips, about 1/2″ wide each (I cut each one into three small pieces). Heat some olive oil in a skillet over medium-high heat, and add the bok choy. Cook for two minutes, then press in the garlic gloves and continue cooking for another 3 minutes before removing from the heat and tossing with the sesame seeds. 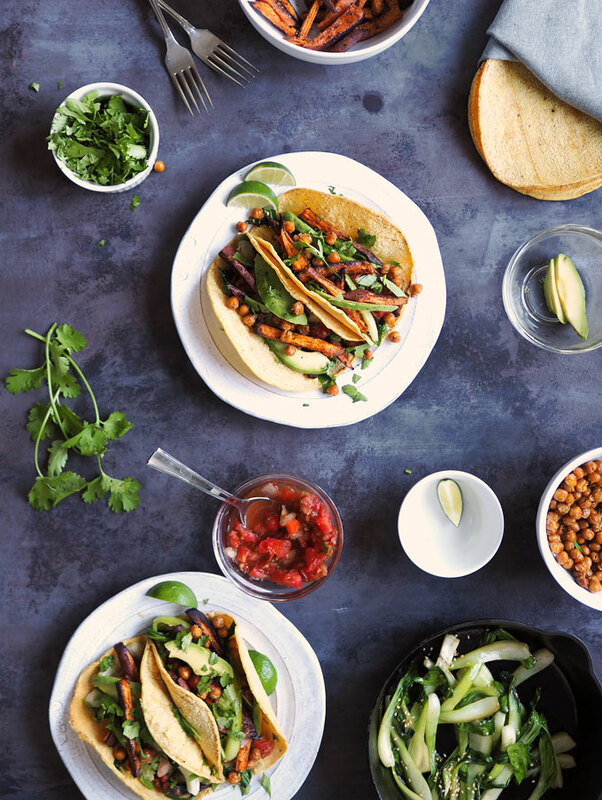 To assemble, layer the bok choy, sweet potatoes, and crispy chickpeas on warm tortillas along with salsa, avocado, and cilantro. Add any other garnishes (like lime!) you like! So much goodness happening here, these are brilliant!